Some things are too big for a boy to solve. Jesse is an eleven-year-old boy tackling many problems in life, especially fitting in to a new school. Luckily he meets Kate. She has curly black hair, braces and an infectious smile. She wants to ‘Save the Whales’ and needs Jesse’s help. But they haven’t counted on Hunter, the school bully, who appears to enjoy hurling insults at random. With Hunter’s catchphrase ‘Ha!’ echoing through the school, something or someone has to give. But will it be Jesse? Kate? Or is there more to Hunter than everyone thinks? From award-winning author Steven Herrick, comes an inspiring and funny story about the small gestures that can help to make the world a better place. This school-based novel is a story of many contrasts: from the excellently bold cover and the whimsical title, to the two main characters – thoughtful Bleakboy and school bully Hunter – who share the narrative, as well as the central theme of our perception of people we cross paths with versus their reality. We get close to Bleakboy, real name Jesse. He talks to a poster on his bedroom wall that he calls Trevor (it’s really Jesus but his parents are Atheist) and is a remarkably gentle 11-year-old. Hunter keeps more of a distance, very much in character, but he’s easy to warm to: keeping the pain he feels a secret, his bullying behavior at school is in sharp contrast to the considerate way he treats his mum. 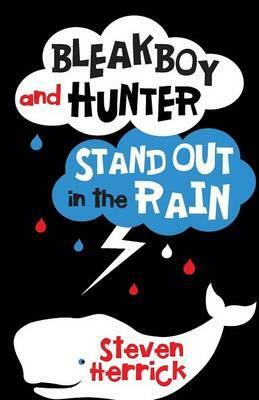 Bleakboy and Hunter Stand Out in the Rain is an interesting look at the kinds of pressures children face today, full of people who are trying to do the right thing. An easy, sensitive read for ages 9 and up. A slice of life story for younger readers told with affection and humour about Stephen, a boy who doesn't quite fit in, and his elderly aunt Lola. From the award-winning author of A Straight Line to My Heart... Ages 8+.